New Admission Without Examination Rule effective February 1, 2014. 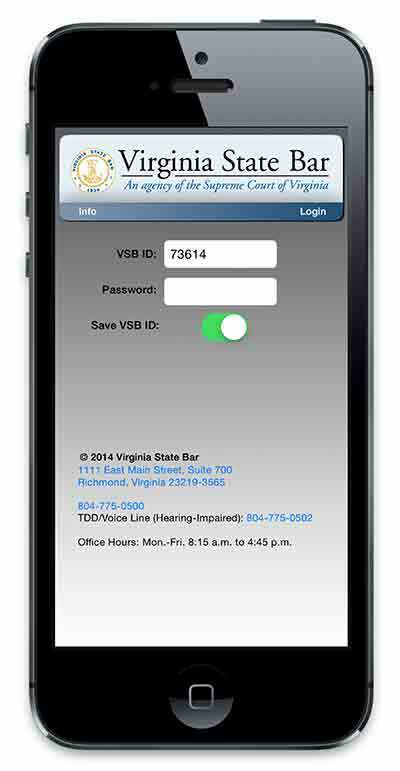 Change of status requests must be processed in writing to the Virginia State Bar. No online process is available. Update Address of Record/Contact Information — Log in to the members area to edit your address (including telephone number, fax number, and email) or print this form (pdf) and mail or fax it to the VSB after filling in the information. NOTE: Virginia Corporate Counsel, Corporate Counsel Registrants, Military Legal Assistance Attorneys, and Foreign Legal Consultants cannot edit their information online. Please submit your updates via fax to (804) 775-0554; email membership@vsb.org or mail. This is a blank generic dues form. Individual attorneys may pay online during dues season. Available mid-June–mid-October.